We are a leading Manufacturer of liquid sulphur fertilizer from Vadodara, India. 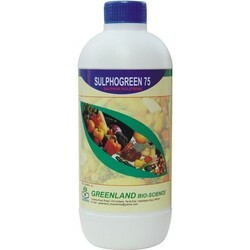 Owing to our vast industry experience, we are offering Liquid Sulphur Fertilizer (Sulphogreen 75). The offered fertilizers are formulated by our qualified personnel using only the superior quality ingredients which we acquire from authentic vendors. Moreover, these act as a good plant food supplement as it is a secondary nutrient liquid fertilizer that contains Sulphur as an ingredient. Our product, further, helps in correcting productivity related issues as well as reduces Sulphur deficiency in soils and plants.